Find the right product for your commercial / industrial / residential projects. Fletcher Insulation has developed� ‘FletcherSpec™ Pro’, an app intended to overcome many traditional issues Architects and Builders face when specifying insulation. 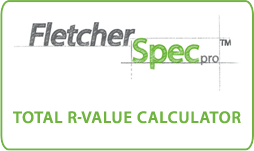 The app provides a near complete support structure guiding users through the entire insulation specification process.� FletcherSpec™ Pro delivers centralisation of the multitude of tasks associated with typical System R-value calculations including but not limited to; determining the relevant climate zone, referencing applicable energy efficiency requirements, considering solar absorption values of roof cladding and selecting the correct insulation products for the application. This drastically minimises the need to manually cross reference inconsistent or out-dated handbooks, technical data sheets and so on. Instead, users simply answer a series of targeted questions which the app uses to determine relevant energy efficiency requirements as outlined in the National Construction Code Deemed to Satisfy provisions. The app then progresses to calculate the Total R-value of the design based on the inputs entered by the user. This saves the user a great deal of time and allows for a streamlined process with regard to specifying insulation. Click here to access user training guides. Have a problem using this tool?